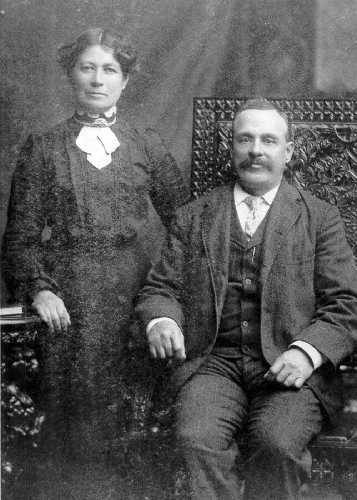 James and his wife Fanny Rolley in the early 1900’s. James Rolley came from Manchester, England, where he had trained as a machinist. His first acreage was close to Rolley Lake, where he came in 1889. He remained on this property until moving to a more central area in 1897, in Whonnock on River Road. The property he moved onto was previously owned by Charles A. Fancher, and in 1901, James received the title to the property. James and his wife, Fanny, had two children; Ruth and Fred. Fred Rolley, married Vera Showler in 1922. Fred and Vera’s niece was Isabel Byrnes. Mrs. Vera Rolley was an active member of the Whonnock Women’s Institute and her home was decorated with her handcrafts, crocheted net curtains, knitted or crocheted wool afghans, and knitted bedspreads made of squares of off-white fine cotton warp. She had entered many of these decorative items in exhibitions. Vera lived in the house purchased by James until it was damaged in a landslide that nearly pushed it into Rolley Creek. Vera moved in with Fred in a house built on the same property where she lived until her death in 1978. 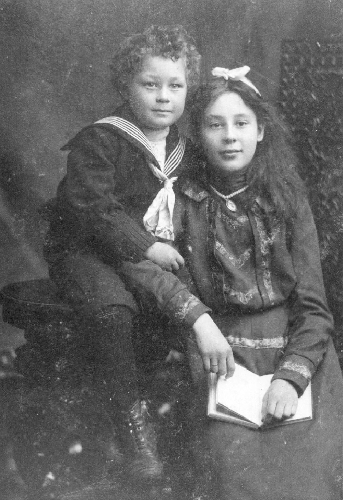 Ruth and Fred Rolley, children of James and Fanny in the early 1900’s. Ruth Rolley married Hector Ferguson, and had two children, Isabel and Rolley Ferguson. Isabel married Brian Byrnes in 1939. A 1940 story in the local Gazette mentions that while Fred Rolley was sawing through a log in Whonnock, he disturbed a huge bear that had curled up inside the hollow portion of the fallen tree for the winter. He had just completed a cut through the log when the bear came out at him, and he defended himself with his axe. Fred had the bear’s hide tanned and made into a rug as a memento of his experience.